Lisbon has fantastic viewpoints over the city. Called Miradouros, they are located at the highest points of Lisbon’s seven hills. You might feel very tired while wander around the narrow streets and staircases of Lisbon’s old neighbourhoods like Alfama, Graça or the castle district, but take heart in the fact that they lead to heavenly Miradouros. A small terrace near the Church of Santa Luzia has been laid out as a viewpoint. There is an excellent view of the Tagus River, the harbour, the rooftops of Alfama and its maze of small streets dominated by the bell-towers of São Miguel and Santo Estêvão. On the wall marking the south side of the square is an azulejo showing a general view of Lisbon. This is the highest point in Lisbon. 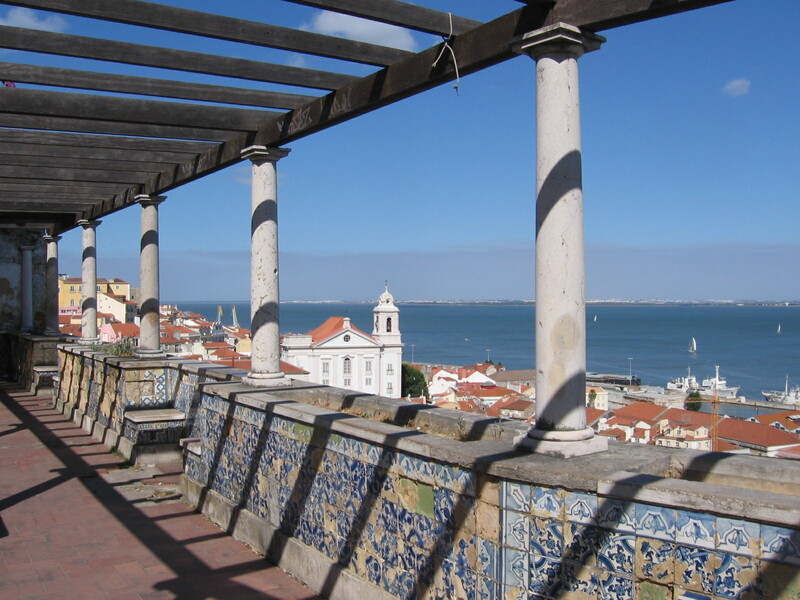 A small square next to the church of Santa Luzia, laid out as a belvedere with a superb view over the Tagus River, the harbour and, lower down, over the Alfama‘s rooftops and maze of streets. The bell-towers of São Miguel and Santo Estêvão are visible as well as St. George’s castle and the Mouraria neighbourhood. 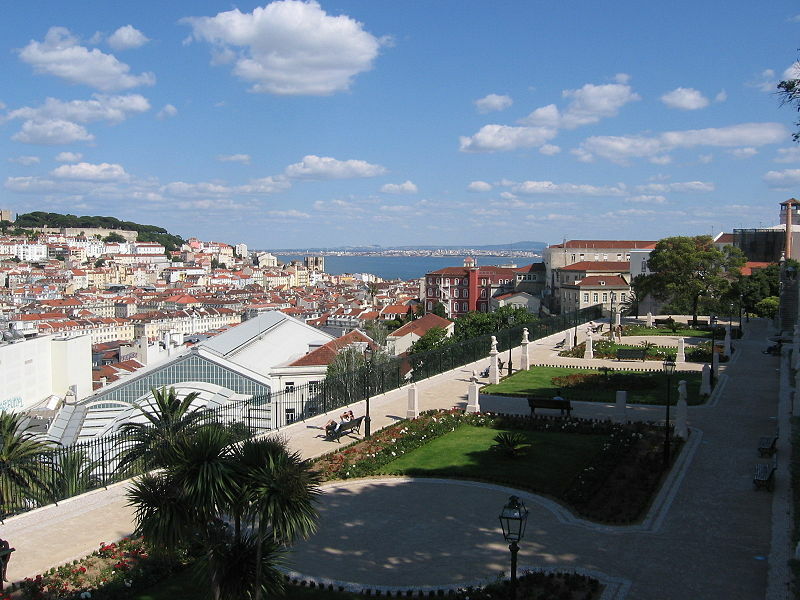 A splendid viewpoint offering a panoramic view of the Lisbon’s castle and Lisbon centre. 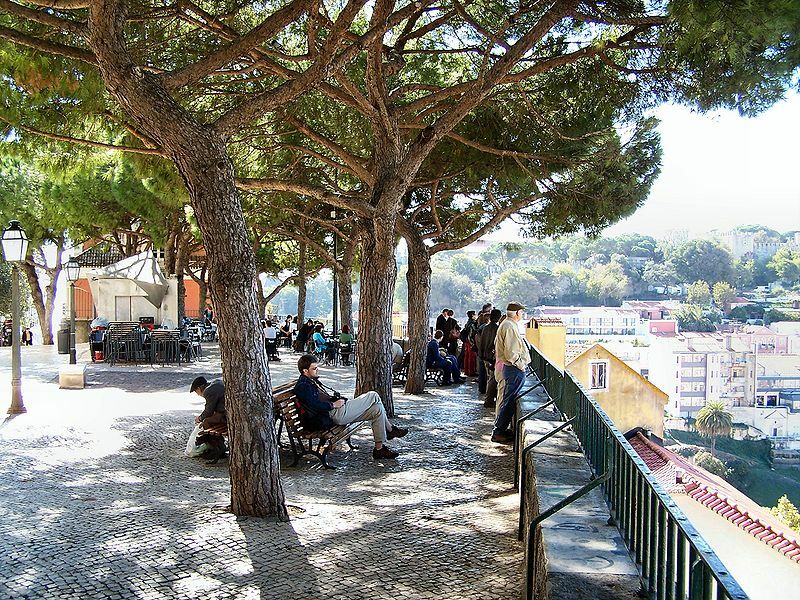 Young Lisboetas flock to this pine-fringed square at dusk for sundowners and sweeping vistas over Lisbon. 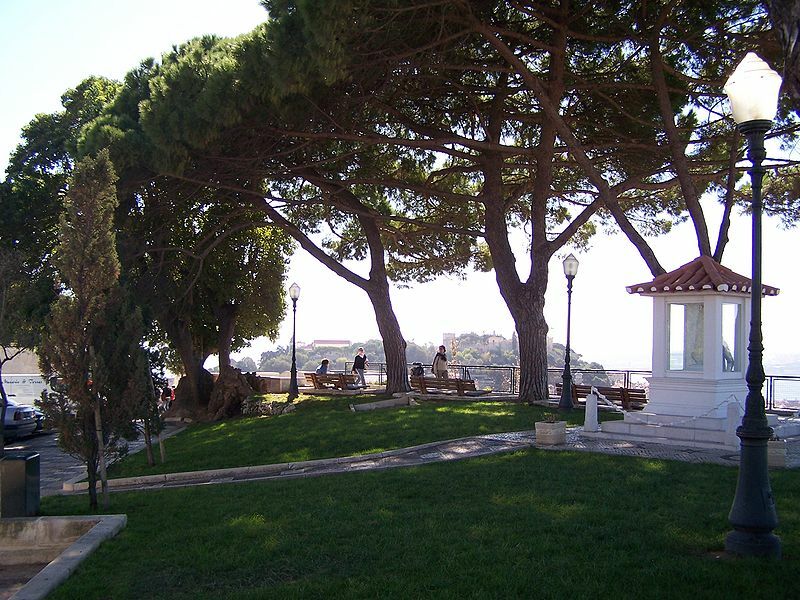 This strategic viewpoint has a great view of the St. George’s Castle and of historical Lisbon. Located close to Baixa and Restauradores, Lisbon’s downtown, this spot is frequented by the youth of the city. Perfect for a lover’s walk. Note that the prettiest way to get here is by the Elevador da Glória. 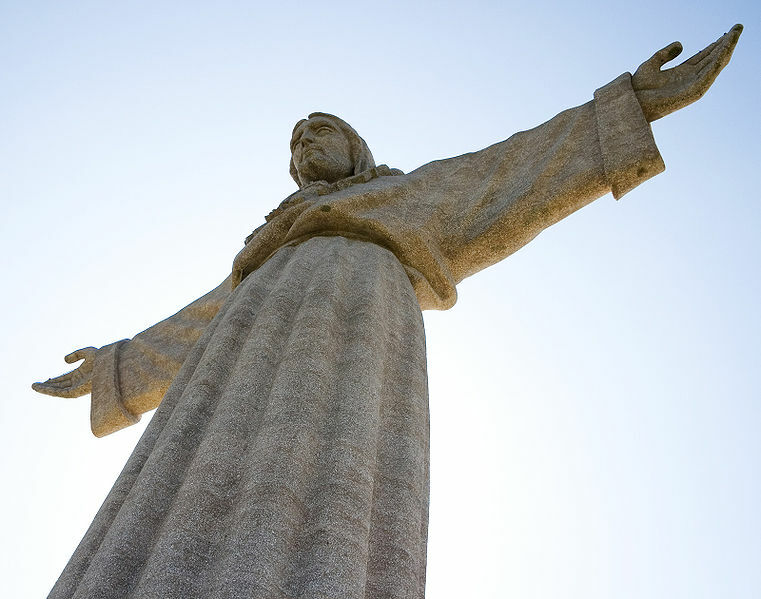 The giant statue of Cristo Rei (Christ the King), a slightly smaller replica of the statue of Christ the Redeemer in Rio de Janeiro, was erected in 1959 in thanks to God for sparing Portugal during the Second World War. It is considered a national monument. The Cristo Rei monument was built on the left-bank of the Tagus River, facing Lisbon on the other bank. 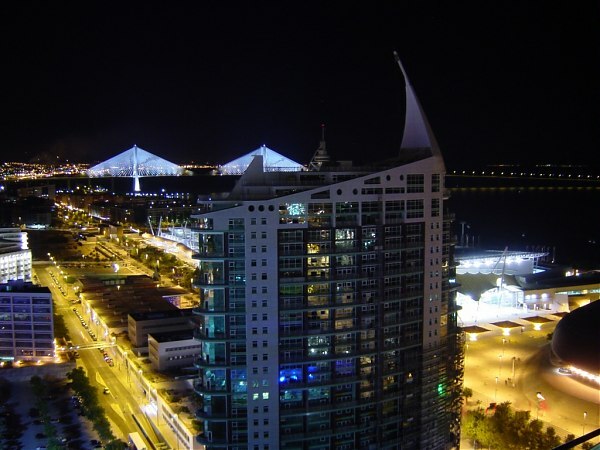 Its located in the city of Almada, Lisbon Region. From the pedestal supporting the 28m statue (access by lift, then 74 steps), which is 85m from the ground and 113m above the Tagus River, the panoramic view is magnificent, encompassing the estuary, the 25 de Abril Bridge and the city of Lisbon , with its typical neighbourhoods and historical monuments, such as the Belem Tower, the Valley of Alcântara, the St. George’s Castle, the Vasco da Gama Bridge, etc. From the terrace you can see the Arrabida Mountains and the Palmela Castle and, in a clear day you can still see the Sintra Mountains and the zone of the Sanctuary os Cabo Espichel, Sesimbra. From Lisbon, the Cristo Rei is accessible by car through 25 de Abril Bridge, by train from the Pragal Station and by Cacilheiro, the famous boat that connects Cais do Sodré to Cacilhas. Parque das Nações is a leisure, commercial, and residential area in Lisbon. It covers an extensive area in north eastern Lisbon next to the Tagus River, formerly used for mainly industrial purposes. The area underwent a tremendous transformation in the 1990s when it was chosen as the location for the Expo 98 World Exhibition. The Expo 98 transformed this north eastern zone of Lisbon into a visionary, ambitious and multidisciplinary project, reconverting an important part of the city by creating a new concept and a modern urban space. One third of Parque das Nações area is green and benefits from unique infrastructures such as the Oceanário, the Pavilhão Atlântico, the Feira Internacional de Lisboa exhibition centre and the Casino de Lisboa. Most visitors will arrive at the Parque das Nações via the Gare do Oriente station, one of the most stunning buildings of the development. The Gare do Oriente station dominates the view, serving as an element of urban order, majestic, and includes a bus terminal, car park, underground station, train station and shopping gallery. The area of the Parque das Nações also provides the visitor with bars, restaurants and street cafés, the Vasco da Gama shopping centre as well as a varied range of services. It is an excellent area for walking and for enjoying quiet moments of true culture, leisure and entertainment. If you want to visit Lisbon and choose to stay in a self-catering apartment in Parque das Nações, we have suggestions for you. Search for apartments in Lisbon, Parque das Nações – Expo.